Release Lifecycle Management Reviews Recently Reviewed! 1. Time to Value-RLML test environment management and deployment processes are streamlined enabling changes to be deployed more rapidly. End users realize the benefits of changes a quickly as possible. 3.Eliminated duplicate and manually-intensive activities. 4. Mitigate Release Failure- there are very less chances of RLM failures. Cons: There are no cons as per my experience. But i feel RLM becomes slow as per load is considered. So load balancing is the area where it should be consistant. It becomes bit slow if single RLM is taking time. Overall: The BMC Release Lifecycle Management suite of applications helps you to manage software release planning, coordination, application packaging, and application release automation. 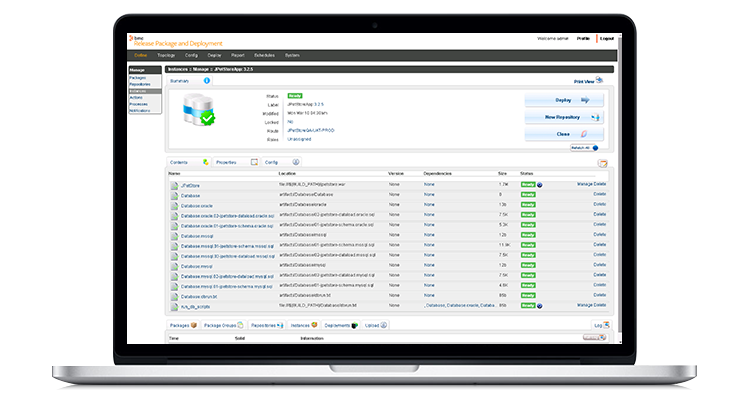 BMC Release Lifecycle Management addresses the challenges of the software release process by enabling all active participants, such as release managers, coordinators, deployers, and administrators, to perform their tasks in a coordinated fashion across multiple releases, environments, and teams. The BMC Release Process Management product helps you to manage the entire release process for software. You can manage multiple software products and multiple releases irrespective of the frequency of releases. Pros: The release lifecycle management plays the vital role in our project life cycle as it proves its importance by making the release management by simplifying the process. The simple and streamline process accelerates the release cycle. The process which earlier take days in maintaining the complex application life cycle now just take few hours in merging and to deliver with the help of release lifecycle management tool by bmc. The pre-build template help in collaboration and auto deploy once the release merger is done successfully. The visibility of end-to-end different product environment help to monitor it. Centralized management is also very helpful in troubleshooting the errors. Cons: Release lifecycle management is easy to implement in new product, but complexity level is little high in case of complex products, but once the implementation is done for the large and complex product you always gonna appreciate it. Overall: The Release Lifecycle Management dashboard helps in tracking the progress of the release and also provides the detail metrics which help in creating the new release plans. We implemented with the most complex product of our organization and achieve in DevOps methodology as manual process eliminates the hurdle in the DevOps process.